I have been on a baking binge lately. I know, most people say, "Aren't you always on a baking binge?" Well let me tell you, I actually was on a crazy baking spree this week. I started by making Dorie's World Peace Cookies last Sunday. I took them to my friend Sasha and she went into labor that night, so she said they really are miracle cookies! I loved the sandy texture, sweet and salty combination, and the rich chocolate flavor and color. I took some cute pictures on my new red swirl platter and they looked great. So I know you're thinking, "What's with the third grader style Paint picture?" Well, my son ran off with my SD card. That's right, he's a tricky little toddler. I put it in my card reader, downloaded a few pictures, and when I came back to finish a few hours later (you know how distractions interrupt things) it was missing. Well, I was so upset I went to the other room and watched three Barefoot Contessa episodes I had on the DVR (He was napping, no way I watch that while he's up, when the only thing we watch are doggies! ), and came back at peace with the fact that my pictures are gone. Which left me with the Paint option. UPDATE- *IT'S BEEN FOUND!!!! * Naturally, he put the SD Card into the DVD drive and when my husband took apart the computer we found it. I don't know why we didn't look there first... lol. Also on my lost card are photos for Thursday's Barefoot Bloggers post and tons of cookies. I got Martha Stewart's new book at the library on Monday and wanted to try it out. I made the Giant Chocolate Sugar cookies (good flavor, bad texture), Raspberry Cream Sandwiches (Vanilla Bean cookies filled with Raspberry White Chocolate Ganache, amazing as they sound! ), Milk Chocolate Cookies (delicious! ), and the cover cookie- Chewy Chocolate Gingerbread Cookies (great texture, but weird flavor combos for me). 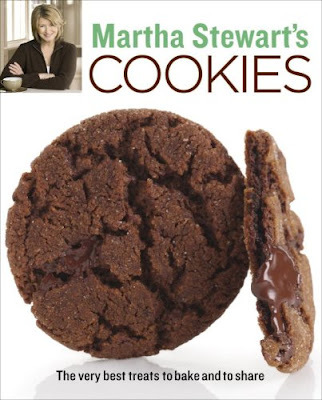 So, pretend like you just saw some beautiful cookies and then go buy the book. The index is beautiful, it lies flat while you use it, and the recipes are nicely laid out and delicious. And in the mean time, go make yourself some world peace (cookies I suppose). Serve with a big glass of milk and enjoy. And let me know if you see my SD card lying around. Working with a stand mixer, preferably fitted with a paddle attachment, or with a hand mixer in a large bowl, beat the butter on medium speed until soft and creamy. Add both sugars, the salt and vanilla extract and beat for 2 minutes more. Turn off the mixer. Pour in the dry ingredients, drape a kitchen towel over the stand mixer to protect yourself and your kitchen from flying flour and pulse the mixer at low speed about 5 times, a second or two each time. Take a peek — if there is still a lot of flour on the surface of the dough, pulse a couple of times more; if not, remove the towel. Continuing at low speed, mix for about 30 seconds more, just until the flour disappears into the dough — for the best texture, work the dough as little as possible once the flour is added, and don't be concerned if the dough looks a little crumbly. Toss in the chocolate pieces and mix only to incorporate. Center a rack in the oven and preheat the oven to 325 degrees F. Line two baking sheets with parchment or silicone mats. Oh, man! What a shame to lose all of your pictures. :( Hope you find the card. Oh, and I'd be happy to come look for it and also be a cookie tester for you. Wow, thatsalotta cookies! I agree, those WP cookies are yummy. Bummer about the photo card! Hope you find it. I'm sure the photos were great, yours always are. I can't believe you've lost your card!? That is so frustrating when you can't find things, happens all the time to me too! I love going on baking binges:) The world peace cookies are popular at our house. They are the perfect dunking cookie:) Looks like you tried some other fun ones too!! The World Peace Cookie are our very favorites! So much so, that Dorie's malted milk cookies paled in comparison. World Peace Cookies are my favorite! Love the World Peace Cookies! They are just so tasty. I've been wanting that MS Cookies book! Thanks for the review.